We asked our Twitter followers if they agreed with this Lancet article calling for a renaming of non-communicable diseases. It received such interesting responses that we invited our network member, Dr Charlotte Augst, for her view. 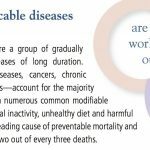 What do you think – should NCDs be reframed? The UK has arguably got the largest voluntary and community sector in health anywhere in Europe. Partly because of a strong tradition of voluntary aid in response to pressing social issues, and partly because of the way the National Health Service is set up and run, we have a thriving third sector of patient organisations. It ranges from entirely volunteer led groups who look after the small number of people who suffer from a very rare condition – providing peer support, bespoke information and connection to progressive health professionals – to a cohort of professionalised multi-million pound turnover charities – whose activities span research, practice and policy work. These large organisations work on behalf of people with heart or lung conditions, cancer, stroke, dementia or mental illness. These and other long term conditions account for half of all GP appointments in the UK and for 70% of all hospital bed days. None of them would choose to describe their work as being about non communicable diseases in the way that internationally focussed campaigners, and particularly those working with UN institutions do. In my view, this should give ‘the NCD community’ pause for thought. The language of NCDs means nothing to the people patient charities work with and for – people recovering from a stroke, people living with the impact of heart failure or cancer on their lives. These people care about a lot of things: how to stay as well as possible for as long as possible, how to make sure crisis and exacerbation are prevented, how to cope with the impact of their health problem on their lives. But they don’t care about whether the condition has been caused by an infective agent or not. and the organisation (and funding) of care on the other: how can we make sure people are diagnosed early, receive the care they need as close to home as possible, know how to use their medicines and so on. Health and care charities in the UK therefore have decided to talk broadly to these two themes: prevention and public health on the one hand and the design and delivery of care on the other. And it turns out that under those two headings it doesn’t matter whether a condition is caused by a virus or not: to convince young gay men to protect themselves from the HIV virus poses similar challenges to convincing young people of all persuasions to drink less alcohol (let’s say). In both cases, we are talking about behaviour change. Equally, to organise care for the many people who don’t just need a sporadic ‘fixing’ of their problem (like a broken bone), but who need medical and wider support in the long run, poses similar problems whether you are talking about long term care for people with hepatitis, HIV or TB, or whether you are talking about diabetes, heart failure of dementia. How can you build a health system around the needs of people who are its main users, but who are currently badly served by the fragmented, siloed and over-specialised nature of many medical services? I am really not an expert in population health in poorer countries, that is focussed on preventing and managing infectious diseases, but it strikes me that in this case too, those ‘system focussed’ questions need to always be resolved. It seems to me that the distinction between communicable and non communicable disease speaks of a hangover that stems from how doctors themselves are educated and therefore think. It is not helpful for making the kind of changes happen that we need to see in order to enable more people, nationally and internationally, to live as well as possible for as long as possible. Dr Charlotte Augst is the Partnership Director for the Richmond Group of Charities, a collaboration of large patient and care charities in England. She has written this blog in a personal capacity.